Acupuncture is an effective method of encouraging natural healing and improved function within the body. 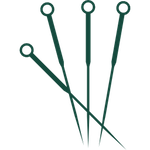 The insertion of very thin needles at specific points stimulates this process, and signals the body to return to balance. We accept both In- and Out-of-Network insurance, and are happy to verify your plan coverage. If you would like us to verify your coverage, please click the link below to fill out a few details, or book an appointment and input your information there! *Call or email to inquire about our price list! Traditional Chinese Herbal Medicine utilizes natural plant and mineral substances blended into medicinal formulas. Often used in conjunction with Acupuncture, Herbal Medicine is a gentle and effective way to treat both internal and external conditions. At our center, we provide herbal prescriptives in the form of convenient capsules and topical treatments for your on-the-go lifestyle. We also work with local herbal dispensaries to ensure easy access and pick-up for our patients! Looking for a facial rejuvenation solution? Our Acupuncture Facial Rejuvenation is a natural anti-aging technique that encourages the body's own healing response to stimulate natural circulation and collagen production, while also addressing internal imbalances, to leave you looking and feeling your most radiant! We recommend that you receive facial rejuvenation 1 to 2 times per week, for 12 sessions to optimize your results. Each session includes both body and facial acupuncture, followed by facial moisturizing, cupping and gua sha. We also offer a needle free facial rejuvenation treatment. Using a jade tool and facial cupping, we will massage the neck and face for a lifting and firming action. It will break up adhesions, invigorate the skin, smooth out wrinkles and increase blood supply to help your skin glow. *Please note that facial rejuvenation is not covered by insurance. Tui Na is a form of Chinese therapeutic massage that addresses patterns of disharmony within the body. This energizing bodywork treatment can be used to address a variety of conditions, both physical and emotional. Cupping is a technique that utilizes light suction, placed at certain points on the skin. This process promotes circulation, eases muscle tension, and can be used in conjunction with acupuncture to treat both internal and external disharmonies. This soothing energy work is an increasingly popular form of non-touch therapy. Our skilled Reiki practitioners work with your body's energy systems to promote healing, calm the mind, and benefit the spirit. Our specialized technique and formula will lift each individual lash upwards to create the appearance of longer, fuller lashes. This lash lift is perfect for everyone with any eye shape and lash length. It also allows you to go about your normal beauty routine every day and will last you 8 to 12 weeks! Yumi Lash Lifts offer you a new look with your own natural lashes, to give you the ultimate "I woke up like this" look.